I served a version of this recipe at my husband’s 50th birthday dinner extravaganza. The menu was essentially a study of his favorite foods - mostly Spanish. Somehow the pie went missing. Caspar claims he never got a bite or even knew it existed. And so I made it again - and again. The dish makes for some fine leftovers however it is also remarkably easy to eat more than one helping so pick your poison. I like it best with a green salad and glass of rose. Rinse salt cod well and soak in a pot a cold water. Soak cod a total of 12 hours, draining and changing water whenever possible. 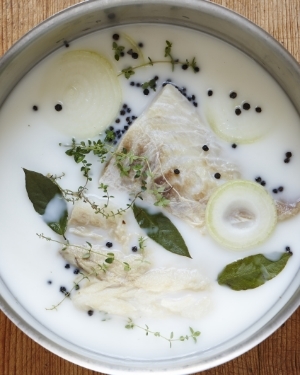 Combine cod, milk, thyme, bay leaves and peppercorns in a large saucepan. Add enough cold water so that fish is submerged. Simmer until fish is tender about 15 minutes. Set aside. Meanwhile peel and cube 1 1/2 pounds potatoes. Place in a large saucepan and cover with cold water. Add garlic. Bring to a boil. Reduce heat and simmer until potatoes are tender. Drain potatoes, reserving both cooking liquid and garlic. Rice potatoes into a large bowl. Flake fish and combine with potatoes along with 1/2 cup of both fish and potato cooking liquids. Mash garlic and combine with olive oil. Heat gently and add to fish mixture. Season salt, pepper,, nutmeg and lemon zest - tasting as you go. Stir in cream and eggs. The mixture should resemble a nice wet mash but should not be soupy. Add more of the cooking liquids if necessary and continue to adjust seasoning. Heat oven to 425. Brush cast iron skillet with about 1 tablespoon butter (mine is 9 inches). Peel remaining potatoes and slice into paper thin rounds. Arrange potato slices in skillet to form a bottle and side crust. Spoon mash into the skillet, mounding slightly in the center. Continue with potato slices to create a top crust. Drizzle top with remaining melted butter and season with a bit of thyme, salt and pepper. Bake until potatoes are golden brown and mash is heated through, it should look and feel piping hot, about 45 minutes.